Listen up, there’s a new search tool in town. The demand is growing, but how do you find podcasts without the effort of subscribing to a feed? Listen Notes is a search engine for podcasts. Currently reaching across more than 410,000 podcasts and 24 million episodes, Listen Notes is searchable by people, places, and topics. Listen Notes is searchable in multiple languages. It offers autocomplete support as well as the ability to add a custom search to your own website. You can also examine trending searches. The search was built by Wenbin Feng, a Software Engineer in San Francisco, who is an avid podcast listener and firmly believes in a bright future for the podcast movement. Feng explains that subscribing to podcast series may not be the solution. Not every episode is worth the time to listen. Think about this: In the early days of the web, people bookmarked websites on their browsers and regularly visited those few websites. When Google became a verb, fewer and fewer people need to bookmark websites. We just search for web pages. Oftentimes, we don’t care what websites these web pages belong to. A podcast is like a website. An episode is like a web page. I bet that the “Subscribe to a podcast then listen” model will change. Listeners will search & find individual episodes to listen if there’s a podcast search engine that actually works . . . If I’m interested in a certain topic, I would just find a lot of episodes from different podcasts about this topic, and binge listening all of them.. . Listen Notes search results take you back to such sources as iTunes, RSS feeds, various blogs, news organizations, and associations, but it is super handy to use Listen Notes‘ inline player to listen to an episode directly from the results page. 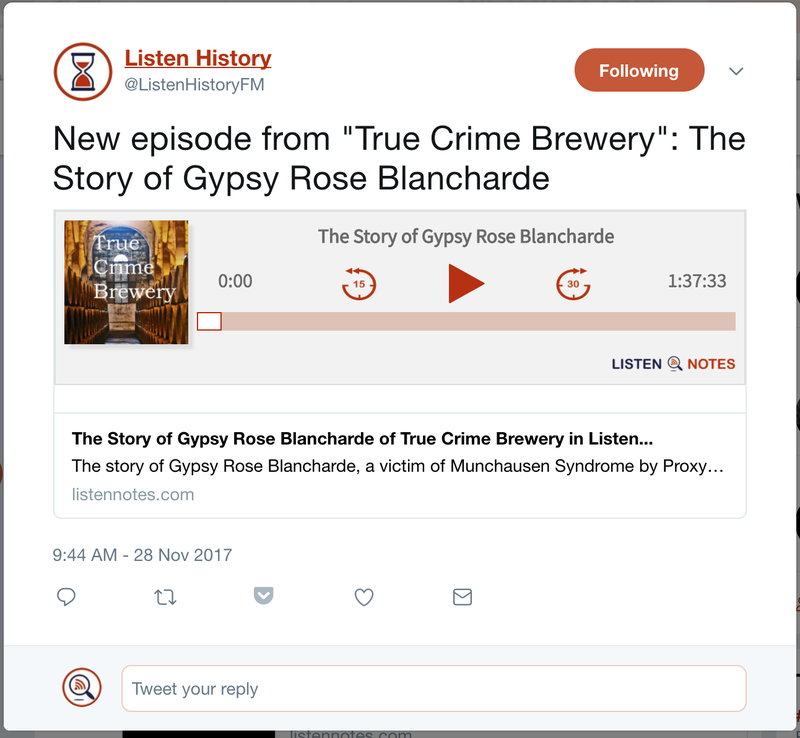 Podcasts may also be downloaded, embedded and shared on social media. In his recent monthly update, Wenbin Feng announced several new goodies, including Twitter player cards that allow your followers to listen without leaving Twitter. He shares a sample tweet. Feng also created three Twitter accounts and Facebook pages offering access to curated podcasts. While very cool for the podcast junkie, at the K12 level, Listen Notes offers a search providing access to an alternate information format, potentially exposing students to a variety of “takes” on current issues. Podcasts are usually free (despite their ads) and eminently portal. Podcasters often present engaging models of the art of storytelling. And podcasts may also foster active and focused listening away from the distractions of a screen.